When Kurt Hoffman visited Tanzania in the 1970s as a young product-development researcher, he could hardly bear to enter village huts to ask questions. “I couldn’t stand the smoke, the pain in my eyes and the coughing,” he said. “And yet the women and children were sitting there the whole time,” enveloped in smoke from traditional open pit fires or poorly functioning stoves. Some 30 years later, when Mr. Hoffman returned to the field in his position as director of the Shell Foundation, a charity in Britain established by the Shell Group, not much had changed. And there may be. The foundation has partnered with Envirofit International at Colorado State University in Fort Collins, to introduce the first market-based model for clean-burning wood stove technology to the developing world. This year, the team plans to begin distributing 10 million stoves, focusing first on India, Brazil, Kenya and Uganda at a variety of prices over five years. Mr. Hoffman played a leading role in the development of the Shell Foundation’s ‘Breathing Space’ program, founded in 2002, one of the first to focus on the problem of indoor air pollution. Half of the world population and 80 percent of rural households in developing countries cook with solid fuels like wood, coal, crop residues and dung. In many instances, women cook around open fires, typically with a pot atop three large stones and a wood fire in the middle. No comprehensive worldwide censuses exist to provide hard numbers. Indoor air pollution, including smoke and other products of incomplete combustion like carbon monoxide, is a major environmental risk factor, usually ranking behind lack of clean water, poor sanitation and malnutrition. The problem does not only afflict the poorest populations. Many affluent households cook on traditional biomass stoves or open fires by choice or because they live in rural areas without electricity or access to modern fuels. The World Health Organization estimates that 1.6 million people a year die of health effects resulting from toxic indoor air. The problem disproportionately falls on women and children who spend hours each day around the hearth. Of that 1.6 million, one million children die of pneumonia, and 600,000 women die prematurely of chronic obstructive pulmonary diseases like bronchitis and emphysema. In China, epidemiologic studies indicate that 420,000 people a year die because of indoor air pollution, 40 percent more than the premature deaths attributed to outdoor air hazards in the pollution-choked urban areas there. Envirofit was formed in 2003 as a result of two senior undergraduate research projects at the Engines and Energy Conversion Laboratory of Colorado State. It develops engineering and technology solutions. 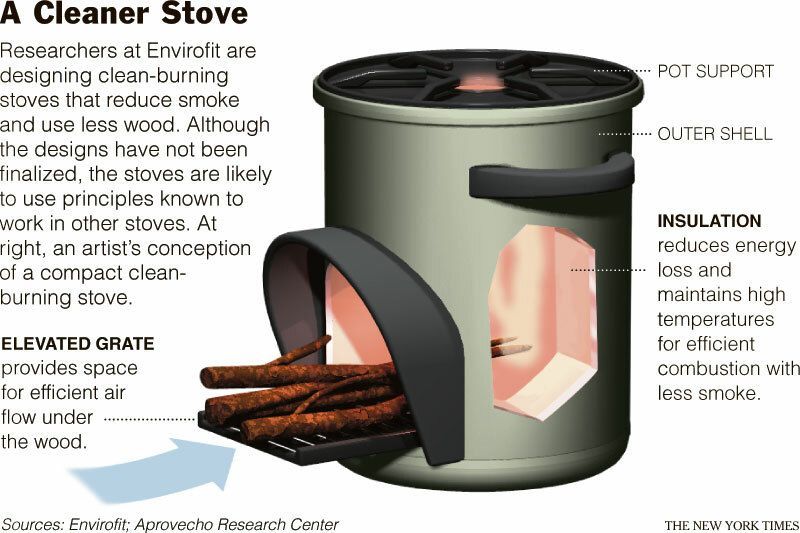 The Shell Foundation estimates that it has invested $10 million in Envirofit’s effort to produce 300,000 stoves on a pilot scale and plans to invest $25 million more to sponsor the stove effort. For decades, numerous small-scale efforts to introduce improved stoves in countries like China, India and Nepal have achieved modest gains. Dr. Smith, who is not involved with the Shell-Envirofit partnership and who will be an independent reviewer of the program, has researched health effects of air pollution in the developing world since the early 1980s. He said one challenge had been the lack of randomized research trials that can show cause and effect, rather than just correlations. Dr. Smith and his colleagues have recently completed a five-year study of Guatemalans cooking on open fires versus improved stoves, the first such randomized trial, they say. The research, the team says, combined with studies in Asia, suggests additional health problems from indoor air pollution, including higher frequency of cataracts, partial blindness, tuberculosis, low birth weights and high blood pressure. The researchers found that cleaner stoves had larger effects than reducing salt in the diet on lowering blood pressure in women, results published last July in Environmental Health Perspectives. Scientists measure air pollutants by the concentration of small particles considered safe to inhale. The W.H.O. target is an annual average of 10 to 35 micrograms of particles in a cubic meter of air per year. The Environmental Protection Agency calls for 15. Yet houses that rely on traditional stoves or open fires typically register in the hundreds or, in some cases, thousands, Dr. Smith said. At Envirofit headquarters in the old Fort Collins power plant, researchers and engineers are designing and testing clean-burning stoves that they say will significantly improve air quality and require less wood fuel. An important feature will be the ability to control carefully the air pulled in, said Bryan Willson, a mechanical engineer who founded the Engines and Energy Conversion Laboratory and was a co-founder of Envirofit. Too much intake cools the process, leading to incomplete combustion. In a modern gas stove, nearly 100 percent of the carbon is burned to carbon dioxide. With traditional stoves in the developing world, 90 percent is fully converted to CO2. The remainder forms a toxic cocktail of byproducts like benzene, carbon monoxide and formaldehyde that billow out in soot and smoke. Envirofit’s stoves will be designed with an insulated chamber that cuts down on energy loss and maintains heat inside the chamber walls. Envirofit has been visiting rural areas to study factors like the ergonomics of cooking habits and preferred color schemes. In India, women tend to squat while cooking, making height an important consideration. Envirofit will offer a variety of sleek ceramic stoves from single to multipot, with and without chimneys, and with colors like apple red, baby blue and gold. The cost is to start at $10 to $20 and run to $150 to $200.. The product development will be at Colorado State, and Envirofit will work with distributors to create rural supply chains. Harish Hande, managing director of Selco India, a solar lighting company that plans to work on marketing and financing the stoves, said the measure of success would be if they caught on with the women. He said that with the right products and a “Tupperware marketing strategy,” in which women make house calls to talk about the stoves, a change might be imminent.